Okay, we finally did it. We made some recommendations. Sure, Transom is dedicated to mission, philosophy, and nuanced storytelling advice, but what you really want to know is: WHAT GEAR SHOULD I BUY… right? (What do writers obsess about… pencils?) Transom Staff have described our personal rigs, and together, we compiled our assessments into dollar-determined good, better, best-ness. There are links to our in-depth reviews and to actually buy the stuff, or at least put it in your Cart and dream. So, let’s indulge our consumerist desires for a moment, and then we can get on with the real work. Feel free to leave a comment with your own preferences. Please note: purchasing equipment through the links provided below helps support Transom.org. It’s hard to keep up with developments in audio recording gear: some classics endure year after year, but other favorites are superseded by new devices, or are simply no longer made. In an attempt to keep up, we’ve updated our list of good, better, and best gear, focusing on the needs of audio documentarians and storytellers. There’s been some churn since the last time we updated this list, although a few items remain in their traditional positions. We’ve included links to in-depth reviews here on Transom, and also links for purchasing this equipment through Amazon or B&H. Clicking through those links on this page, and purchasing your gear from those sites, helps to support Transom.org, and our continuing mission to keep you informed about tools and techniques for better audio storytelling. What we like: Although it has no built-in mics, we like this recorder’s good-sounding mic preamps; the XLR and mini mic inputs; that it can be hands-free by hanging from a strap, with meters and control knobs accessible; its multi-track and safety-track capability; and its affordable price. What we like: The Zoom H5 has excellent built-in microphones, XLR and mini inputs for external mics, well-designed knobs and controls, its ability to record from the built-in and external mics at the same time, or to record safety tracks at a lower volume. The H5 also feels good in the hand, and has decent battery life on two AA batteries. This Omnidirectional Dynamic mic has a low output, so it requires a recorder with good mic preamps (such as the recorders listed on this page). The M58 provides a classic news reporter’s sound, is resistant to handling noise, wind noise and P-pops, and has a conveniently long handle for easier positioning. This Condenser Short Shotgun has a strong output level, good focus on sounds in front of the mic, and rejection of ambient sounds from the sides. It can be phantom powered by an internal battery, reducing the drain on a recorder’s batteries, or allowing use with a recorder with only mini mic inputs. We never imagined that anything would replace the Sound Devices 722 and 702 at the top of our recommendations, but these new recorders from Sound Devices are smaller, more flexible, less expensive, and still sound every bit as great as their predecessors. On top of that, they are USB computer interfaces as well as field recorders. This Modular Short Shotgun mic has a very hot output level, sharp focus on sounds in front of the mic, and rejection of ambient sounds from the sides. Its modular design allows conversion to different mic types with additional components. It can be phantom powered by an internal battery, reducing the drain on a recorder’s batteries, or allowing use with a recorder with only mini mic inputs. This stereo condenser mic is a bit heavy and expensive, but it works equally well as a mono interview mic, or as a stereo mic for recording ambience or performance. Its Mid-Side design makes it solidly mono-compatible, while providing an adjustable stereo width control, as well as an un-matrixed M/S output. Jeff Towne, our Tool Master, has perhaps the web’s most comprehensive Portable Digital Recorder Comparison, along with a field-recording Handhelds: Microphone Shootout and advice on What Gear Should I Get? There’s plenty of great audio recording equipment out there, but the above are what some of us at Transom currently use, for our own gigs and in our Story Workshop. Your first splurge should be on headphones: get the Sony MDR7506 model mentioned in the “best” category. Although they don’t directly affect the sound that’s being recorded, being able to monitor accurately might have the biggest effect on the quality of your recordings. I used to use a set of Etymotic in-ear headphones almost exclusively, until one of the earpieces broke. That might have been due to trying to pull them out too rapidly, and that’s my primary hesitation about that style of headphone: you can’t take them on and off quickly. It’s helpful, and sometimes safer, to be able to hear the real world in its actual stereo spatial representation, not just what’s coming down your mic. So I’ve gone back to the good old Sony 7506s. I honestly can’t think of any headphones I’d rather use in the field. I’ve worn some ridiculous high-end phones in some studios, but I’m not sure I’d use them for location recording. For critical recordings, where sound quality is at a premium, I use the Sound Devices MixPre6 (or for very complicated recordings with many microphones, the MixPre10T) and a Sanken CS-1e Short Shotgun microphone. That mic not only has a great sound, but it’s also very small for a shotgun, and has the same “reach” as a larger mic. That makes it very useful for video shoots in tight spaces, but it’s also just convenient to carry around. When I can get-in close, I like the Neumann KMS 104 cardioid condenser mic, for its clear, rich and natural sound. Both those mics and the recorder are very expensive, but you do get a noticeable increase in sound quality and reliability for that expense. These are amazing tools. For less-critical projects. I use the Tascam DR-100mkIII recorder (Transom review) with a Rode NTG2 short shotgun mic. I’m still a big fan of the discontinued Sony M10 too, it’s often in my bag as a back-up. I keep hoping that Sony will resume making these, or a similar replacement. Many of the small recorders have very good built-in stereo microphones. Take advantage of them! I don’t recommend using the built-in mics for interviews, but they’re often perfect for getting immersive ambiences and vivid documents of events. I often grab the Zoom H5 if I know I’ll need to record a performance, or ambient sound. The $99 Zoom H1 is remarkably good for a $99 recorder, but it feels less durable than other recorders, the built-in mics are insanely wind-sensitive, and it seems a bit less reliable overall than many other recorders, so I’m reluctant to give it a hearty recommendation, but it can be a good choice when the budget is very tight. And here’s the most important part: we’re suggesting that people mix and match recorders and mics, but as I wrote in a recent sidebar, almost all of the cheap flash recorders require a hot-output mic to avoid sounding super-hissy. I’d almost recommend the Tascam DR-40 (Transom review), but it requires specific mics to get clean recording. Jeff uses: Tascam DR-100mkIII and Tascam DR-60D recorders, Sound Devices MixPre6 and MixPre10T, Rode NTG2 Short Shotgun mic, Sennheiser K6/ME66 Short Shotgun Mic, Sanken CS-1e Short Shotgun Mic, Neumann KMS 104 Mic, Sony MDR7506 headphones. Once you make friends with the Sound Devices 722 — it rocks. No sound issues at all at all (as long as you know your phantom things). I’ve been using the Beyer M58 (dynamic ENG/EFP omnidirectional microphone) forever: rugged, solid, forgiving mic, pretty ample omni.As for recorders, I use I like the Marantz PMD 660 (Transom review) because it has XLRs and a window I can see — it doesn’t feel like a toy and the buttons are almost old school. It feels reliable: makes me feel safe. Viki uses: Marantz 660 or 620 (Transom review) recorders, Beyer M58 mic, Sony MDR7506 headphones. I use the Tascam DR-60D (Transom review) with either a Beyerdynamic M58 (Electret condenser microphone for ENG/EFP) omni mic or an Audio-Technica AT8035 shotgun (Line + Gradient Condenser Microphone), and Sony 7506 headphones. What I like about the Tascam DR-60D is that it has two XLR inputs. I also like that it’s big enough to have a shoulder strap so that I can carry it over my shoulder (with the level meter in plain view) but it’s not so big that it feels bulky. I do a lot of multimedia work these days and sometimes need my hands to use a boom, so being able to sling my recording rig around my neck helps. I use an Audio-Technica 8035b shotgun when I want good, focused sound and the Beyer MCE58 when I want an omni-directional. Samantha uses: Tascam DR-60D recorder, Beyer MCE58 and Audio-Technica AT8035b, Sony MDR7506 headphones. My usual go-to rig for field work is a SD-722, a combo of a Sennheiser MKH 20 omni condenser and a Sennheiser MKH 416 short shotgun, with Sony 7506 headphones. I use the full condenser Sennheisers because they aren’t affected by humidity like electrets are. Two cardioid Sennhesiers would be a good alternative to a stereo mic like the VP88 for those who want separate mics–handy for interviewing more than one person at a time. The Sennheiser K6 capsule system is awfully useful because you can get lots of capsules for one pre-amp, e.g. omni, cardiod, short shotgun, and lavalier. Actually, I liked the old K3U system even better and still use those, but the K6 is great and also a good mic setup if you do video. If I were to take a backup recorder, it would be the TASCAM DR-100mkII. If we had an “okay” category, I’d put in the iPhone. I’ve made stuff from things I’ve recorded with just that. Here’s an iPhone recording, using Griffin iTalk Recorder app and built-in mics on an iPhone 4 of Jake Shapiro, in an indoor parking garage, playing a drum I had just bought for my son for Christmas. With the iPhone, I sometimes use the Apogee MiC when I’m on the road and need to get some tracks to the radio station. It’s good quality and the iPhone lets me upload an uncompressed from from iTalk right to Dropbox, email or whatever. It’s expensive and subject to wind/handling/interference noise, but it’s a good USB mic and also goes direct into the Mac. The newer Apple earbuds are quite good. For “better” over the ear “walkman” style headphones I use the Sennheiser PX 100. They have a model you can use with cell phones too. Very nice for $40-60. Jay uses: Sound Devices 722 recorder, Sennheiser MKH20 and MKH416 mics, Sony 7506 headphones (with backup: Tascam DR-100mkII recorder, Sennheiser K3U capsule mics, Sennheiser P100 headphones). Here’s the deal. I’m a radio producer. I’m not up to my neck in cash. So, I can’t buy high-end gear. At the same time, it’s incredibly important I use gear that is reliable and sounds great. So, it pains me to no end (insert shaking fist here) to tell you that the gear I love the most and use all the time is no longer made. The Sony D50 (Transom review) and the Sony M10. Given the disappearance of both Sonys, I recommend two other rigs – rigs I will likely consider when it comes time to replace what I currently own. One is the Tascam DR100mkiii. It may not be quite as rugged as the Sony D50. But, it’s solid, sounds great, and it has XLR inputs (the Sonys had mini-plug inputs). The other is the Zoom H5. Frankly, I never thought I’d find myself recommending a Zoom. The H4 was so notoriously hissy I wrote Zooms off. However, they solved this hiss problem with the H5. In fact, they did such a good job, we just bought a slew of them for the Transom Story Workshop in order to replace the Sony M10s we used for years. We might have gone for the Tascams instead, but they’re a couple hundred dollars more. For microphones, I almost always use the Audio Technica AT8035b. Talk about a good sounding mic. Jeezum crow. Love it. And, because it’s a long shotgun mic, I don’t need to get in people’s personal space as much as I do when using my back-up mic, the Electro-Voice RE-50. I also have an Audio-Technica AT822 stereo mic and a low-cost set of binaural mics from Sonic Studios but I don’t use them very often. Lastly, the headphones. I always wear the Sony MDR7506. First and foremost, they’re comfortable. I don’t want to wear a set of earcuffs for hours and hours — comfort is important. They’re very good at isolating external sound but not so much that it feels like I’m in a sound isolation booth or something. And, they sound great! Rob uses: Sony D50 recorder, Audio-Technica AT8035B mic, Sony MDR7506 headphones. Students at the Transom Story Workshop tend to be beginners. Many have never picked up a mic or turned on a recorder before. So, it was important for us to choose a field recording pack that both sounded good and was simple for novices to use. Plus, since the Workshop started from scratch in the fall of 2011, we needed to find gear that fit our start-up budget. We landed on the following and felt we made the right choices: Recorder: The Sony M10. Unfortunately, Sony stopped making these recorders, and we needed some new recorders, so we’ve chosen the Zoom H5. Mics: We have a slew of mics on hand for the students including the Electro-Voice RE-50, the Beyerdynamic M58 and MCE-58, and the Audio Technica AT8010. I’m a fan of the RE-50 and the MC-58 for new producers because they are more forgiving of mic handling noise. But, all of these are excellent mics. Headphones: We used the Sennheiser HD202 for quite a while because they were very inexpensive. But, we had to replace them frequently. The cable would fray where it connects with “the cans.” So, now we use the Sony MDR-7506. TSW uses: Sony PCM-M10 recorder; Beyer MCE 58 and M58 mics, Audio-Technica 8035B and 8010 mics, Electro-Voice RE50soices RE50 mic; Sony 7506 and Sennheiser HD202 headphones. Here are links to most of the gear mentioned in this article at B&H Photo Video. Purchasing through these links helps support Transom.org. I was a little surprised the Tascam DR-40 didn’t get a mention as an alternative for some of the other recorders. Alas, I would love to go with a DR100mk2, but it lacks the one killer feature of the DR-40, dual record mode. Oh, I’m not going to blow a recording by peaking out, because I have a -6 or -12 db backup? Sold and sold. Maybe the mk3 will have it. Aside from that, well done. I love my 8035, and my Rode NTG1s (it’s the NTG2 without the battery). Great roundup. Yeah, I like the Tascam DR-40, especially because of its dual-record mode, but as I mentioned in my comments, it just sounds terrible with an RE-50 or Beyer M-58, so it’s not a great candidate for mixing and matching with any mic. But with a high-output mic like the Rode NTG-1 or 2, or really any condenser mic, the DR-40 is a pretty nice recorder, especially for around $150. I have two RE-50s that are the N/D-B style, but I’ve barely touched them. I wonder how they do with the DR-40, since they should have a higher output. I guess I should experiment. As always. Thank you Jeff and Co. This is great. I’m hoping someone can recommend a model of the “tiny monitor earphones that musicians now use on stage” that Barrett mentions. Thanks! Zak, one of the in-ear earphone monitors i use is listed/linked at top, under Headphones. it’s called Etymotic Research HF5. but right now i mainly use a pair by Ultimate Ears, and have used Shures in the past. any quality one will do. good ones start at $150, but you often see a street price closer to $100. as these small earphones are kinda fragile, i always have two w/ me. Thanks for the summary. I’d like to point out that the Sound Devices is a wonderful instrument, and if you don’t need the redundancy of the hard drive, you can get one for $1800 or so. Alot of money, but still, your last recorder. Mics: Maybe I missed it, but do the dynamic mics, like the Beyer or the EV635/RE50 play nice with the DR100mk2? Yes – the Tascam DR-100mkII sounds pretty great with just about any microphone, a significant improvement over the original DR-100. Here’s another vote for the Sound Devices 702 in the “best recorder” category. Unless you really need the capacity of a hard drive (and CF cards have pretty high capacity these days) or the redundancy of recording to both hard drive and CF, the 702 offers the same preamps and performance as the 722 for 25% less $ (lists for $1875 vs $2500). My students and I have had good luck with the Olympus LS10 and LS11 small recorders, both with their built-in mikes and with plugging a handheld omni like an AT8010 into it for mono interviews. Olympus has been propagating a whole slew of later models since the 10 and 11…some are improvements, some are less capable than their forebears. But this line offers great battery life. And a pleasant discovery in the mikes dept is the Audio Technica AT875R condenser short shotgun. It offers good directionality coupled with a smoother more pleasant voice tone than most of the hyped-up-sounding short shots out there. Under $200, phantom only, and physically smaller than the Rode NTG2. PS: The 702 recorder is also quieter than the 722. In some quiet interview situations, the whirr of the hard drive on a 722 can be picked up in a nearby microphone. But the 702 has no hard drive. Personnally, i use a Sound Device USBPre 2 (preamp and audio card bus powered) and a Tascam DR100MkII. The USBPre 2 have the same preamp as the SD 7000 series and it have a spdif out and you can powered it with a usb lithium battery for up to 10 hours and more of autonomy. This is even cheaper solution than the SD 702 for the same result! Good choices overall. But, as I recall recommending back in the 1980s at NPR on a similar good/better/best list (and if it’s not already obvious), the reporter/producer/recordist kit should never include only a single microphone. There is no one “best” mic for all applications. Just as a photographer may have a preferred single camera but multiple lenses, a recording kit can be built around a single recorder, but with multiple microphones. The ideal group should include (1) a shock-mounted dynamic omni, (2) a decent (short) shotgun with one or more windscreens, and (3) a single-point stereo mic — in that order of priority.They are not good/better/best — they are apples and oranges. Regardless of recorder, ideally, you should have one of all three mic types in your kit. And the mics recommended here are all excellent examples of each (e.g., Beyer M58, Sennheiser MKH-416, Shure VP-88). For the latter two mic types, appropriate fishpole with shockmount are also important. Also totally agree with Jeff on making your first splurge on the headphones. The Sony MDR-7506 would be my choice for that as well. Skip MuthaFreakin Pizzi, the God of Audio Eng, the Ghost of “The NPR Sound” Past, and the Granddaddy of this Good/Better/Best list. It was your G/B/B list in the early 80s NPR Producers’ Handbook that inspired this very Transom post. So many of us then-neophyte producers used your gear-selections as a shopping list. Every time we got a few more shekels for a grant of some-such, we’d see what we could afford a little higher up your totem. Can’t tell you how much and how many people you helped, ‘cept to say: Thanks for that. So, to the rest of y’all, suffice to say, pay attn when Skip speaks. Same for Flawn’s comment above. When Skip was Chairman of the NPR-Eng Joint Chiefs, Flawn was one of his 4-Star Generals. I can’t thank you enough for sending us this INCREDIBLY HELPFUL INFORMATION. THANK YOU!!!! Sennheiser uses a different transducing technology called “RF condenser” in its MKH series of mikes, and that is what gives them their excellent resistance to humidity noise problems. “RF” here stands for “radio frequency”, but this is a different application of radio-frequency than the now-ubiquitous wireless mikes. For a long time Sennheiser was the only company using this method, but Rode popped up with the RF conversion method a few years ago in their NTG-3, a shotgun mike that is pricier than the other Rodes mentioned here. Perhaps Rode licensed Sennheiser’s patents, or perhaps those have now expired. And what happened when my RSM-190 stopped working in the rainforest? I switched to my backup mikes! Just like everybody says above, ya gotta have backup. In this case, Sennheiser MKH40 cardioid and MKH30 bidirectional mikes set up as an MS pair, which behaved perfectly in the worst of the humidity. These mikes are great performers anywhere from the concert hall to the ends of the earth. And I offer eternal thanks to Greg Budney of Cornell U’s Library of Natural Sounds who gave me the advice to make sure I had the Sennheisers with me on that trip. I’m surprised there was no mention of the Zoom H4N here. You’ve done reviews on it before, but how does it compare to the Trascam DR-100mkII or even the Sony PCM M10? I know the DR-40 is supposed to be a more direct comparison, but the M10, DR-100 and the H4N are closer in price and from what I’ve read have sturdier, less plastic-y bodies than the DR-40. I’m just starting out, and I’m looking for a great starter set on a budget–I already have a Zoom H1, which is a great little powerful thing, but way too sensitive for regular use, especially outdoors. I just borrowed a Sony PCM-D50 for my first story and it was GREAT, but for $500, I just can’t afford it. I’m looking to spend no more than $500 total — including an external mic and hopefully headphones — and that’s only because it seems like I can’t really spend less than that to get started. Thoughts? Help! Oh, and any word on these Sony headphones? 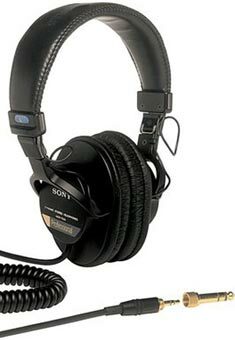 http://www.amazon.com/Sony-MDR-V6-Monitor-Series-Headphones/dp/B00001WRSJ/ref=pd_cp_MI_2 They’ve got GREAT reviews and are less expensive than the ones featured above. Thanks in advance! Whether you get the MDR-V6 or the 7506, eventually you’ll probably lose the screw-on mini to quarter inch adapter. In a rare feat of compatibility, adapters from Sennheiser, Pearstone, and perhaps others will replace the Sony adapter just fine. I’m a beginner and was looking at the Zoom 4N since the Sony PCM-M10 is no longer available. I notice you posted your “I’m a beginner on a budget” question in 2012. That is me now. Please let me know if you bought the Zoom 4N then and how it worked out for you. Thanks! Thanks for the comprehensive analysis! I just have a quick point: is Olympus LS-100 so problematic that it hasn’t been mentioned here? I used to to think that at least it can nicely compete with the Tascam DR-100mkII. Jeff, I’m still looking for your LS-100 and DR-100mkII reviews as I want to compare these two. The main goal of this post was to convey gear that we’ve used regularly, for a long while, either as individual producers, or at Transom/Atlantic Public Media, or in the Transom Story Workshop. I’m sure there’s lotsa other great gear out there, and hope folk continue to leave comments about that gear, as you did. But the above Good/Better/Best is all gear we have depended on, so can personally recommend. Contrary to the official Transom verdict above, I find the combination of Sony PCM-M10M and Beyerdynamic M58 pretty hissy- almost to the point where it’s a problem for professional work. I bought this combination for the reasons given in the article- low handling noise, not too expensive but professional quality- and I now find myself buying a higher output mike to go with the M10. Thanks for the great info. I found this page while searching for details about the audio equipment NPR uses for their musical “Field Recordings”. The audio is always really great, despite the sometimes less than ideal environments as you can see on the latest recording of the Civil Wars below. Any idea what kind of mic or other audio gear they might be using for these videos? NPR’s engineer, Kevin Wait, uses a Sennheiser MKH418S stereo shotgun and a Sound Devices SD722 for those field recordings. Thanks for info! I did a quick search for those devices and found the forum thread below that provides some more details about Kevin’s choice of equipment and recording techniques. Thanks very much for the info. I’ve mostly done tv work but want a digital recorder since my dslr camera is a bit limited, plus I want to be able to do radio work and I’ve realised my old recorder isn’t up to the job I think. Can anyone suggest the cheapest recorder I could get that would offer broadcast quality audio, something that you’d suggest for a student perhaps? I’ve spent hundreds on my kit already so am on a tight budget. I know I’ll have to buy something second-hand or on ebay which is fine but am hoping to spend around $100… if that’s possible. Thanks. Has anybody tried the Sony ECM-MS957 stereo microphone? It’s mentioned in the PCM-D50 operating manual. hi – what a great resource – thank you! From my cursory research, the Audio Technica AT8035b appears to be a condenser mic, which I would not think the Sony PCM-D50 can handle. So, how does he make that work? Is it necessary to first purchase the Sony XLR Adapter for $450, which –as I understand it– provides the phantom power necessary to use a condenser mic (as well as allow for the use of XLR hookups)? What is stymying me (as I try to figure out what rig to buy) is if the $450 Sony XLR Adapter is not purchased, is there a high enough quality dynamic mic to do professional radio-quality work, using the Sony PCM-D50? I am talking, specifically, about interviews with people in indoor settings, trying to get rich vocal quality, with relatively little background or ambient noise. Greetings from Army life in Kuwait. Comments on recorder and earphones — some by way of reading this article and making purchases. The Sony PCM-D50 has very little advantage, in my opinion, to the M10. The limiter circuitry is the same in both models (important), the preamps are both super quiet, and battery life is great in the Sonys as mentioned. My only gripe: none of the super small digital recorders on the market have separate gain knobs for each channel (one can dream). The M10 has the leg up because it’s smaller. This, to me, is super important. The smaller the device, the more likely it’s going to be on your person AT ALL TIMES. I’m on active duty in the Army (for one year only) as an infantryman (my second rodeo doing this) to put the soldier’s voice on air. I’m trying to capture the canny moments that normally don’t get recorded. To do that the recording gear has to be small and durable. My choice was a PMD 662 with the Oade modification ($500) or the M10 at less than half that price, with a dial gain knob — also critical to me. I bought a belt clip made for a police radio on http://www.theclip.com, drilled a 3/8″ hole in it, found a 1/4″ X 20 flathead screw that measures 1/4″ in length on fastenal.com and screwed the clip right into the tripod mount. Now, that M10 is a belt-worn thing that looks like a beeper. It hides under a combat uniform and hasn’t failed me yet. I plug a Sennheiser wireless receiver into it now, also belt worn just adjacent. I LOVE the setup. Rob, BTW, I’ve dropped mine five times already. Twice on concrete and once in the belly of a DC-10 two days ago. After Barry’s raving review on the Etymotic earphones, I picked up a pair. Let me just say this guys: the fidelity in these things is absolutely off the charts for the price. Crazy!!! Music never sounded better. I lost a pair of $400 Shure earphones (left in an aircraft) about five years ago and never bought expensive earbuds again. Though the Shure’s were built better, the Etymotics sound MUCH more flat, accurate and dynamic overall — and only 1/4 of the price. That said, lets face it: they are tiny wires. They break. They get lost and left on airplanes. They are NOT the be all, end all solution to monitoring a recording. IMO, these are nice to have in your kit, but not before first purchasing over-ear “cans.” One more thing: I have to disagree with Barry that these little guys would actually hear plosives well (super low-frequency wind noise, etc.). But, to his point, they isolate sound superbly well — better than over-ear headphones. In fact, they work better than the ear plugs we use on the .50 cal range (I tested that, too ;). Finally, on microphones, I think we’ve reached the point where we require our microphone to be self-powered (by battery). These new recorders with 1/8″ stereo mini jack won’t supply phantom power. If we own condensers that require phantom power (I’m in this boat), I think I’m taking the loot to eBay. I’ve decided that the best way to go is to buy a powering module like a Sennheiser K6, and buy capsules for it as funds allow. I frustratingly had this same ideology six years ago when I bought the AKG Blue Line stuff (SE300b, etc.). I should have gone for something w/ an internal battery — big mistake. Is the problem with the Marantzs at this point just that the smaller/lighter ones don’t allow for any phantom power, or is it the price? In the “I’m surprised” camp – it seems like something that’s such an industry standard at least deserves a why we’re not including it note. Thanks, as always for y’all’s enthusiastic gear advice sharing. I’d really love to see a Tools article on storing equipment and how you travel with gear. I’ve learned a few things the hard way, so I’m always curious how people organize and protect their gear. The exclusion of the Oade-modified Marantz PMD-661 mystifies me. This is a great unit, and the preamp mod costs very little relative to the cost of a new 661. The mod eliminates the hissy preamp issue. The Marantz has XLR (48V phantom) as well as miniplug inputs, RCA outs, and a S/PDIF digital in. The only weak point is its underpowered headphone amp, but for interviews, it”ll work just fine. I use mine with an RE-50N D/B and an AT4073a ‘gun, and it sounds great. The Oade is indeed a fine piece of hardware, but the above recommendations are limited to what we at Transom own and use regularly — aka, gear we can vouch is battle tested. Wonderful! – the Transom Tools recorder recommendations – very inspiring and very helpful. Has anyone compared the Olympus LS-5 / 11 to the Sony PCM – M10? If so do they agree with the following reviewers that the LS-5 is better? The LS-5 is available in / from Europe and not in the US, but that’s what shipping is for. ; ) Approx $200 plus shipping. Jeff, I notice that no one is recommending using a wireless lavalier mic with a DSLR (in my case a newly purchased Sony A57) to capture the warm, intimate sound of a subject who is moving around at some distance from the camera. I’d like to enable that person to be able to move freely and still film him/her from a distance of 5-25 feet without my having to chase them and impede their spontaneity by being in their way. I’ve been warned by both professionals and customer reviews that wireless lavs in the range of $150-200 (like the Audio Technica PRO88W-R35 Wireless Lavalier System with ATR3350mW Omnidirectional Mic) pick up static and rustling of clothes and that to avoid them one has to spring for something like the $600 Sennheiser EW122P G3 EW122-P Wireless Lav Mic. I know that any lav mic won’t compare with the sound of a good handheld mic but since I’m filming as well and don’t want to mic in view, it seems a lav mic is the only way to go. If I’m also recording myself, will a $200 range lav mic work well enough for that purpose? I also have a three-year-old Sony PCM-M10 that’s been dropped a few times but still appears to work. I could graduate to a Tascam DR40 to capture the external lav mic sound or plug the receiver directly into the Sony A57. Which arrangement would you recommend? Many thanks for any advice you can offer. I’m a senior in high school just getting into radio journalism. I’m doing a story about the Appalachian Trail and need to get some recording equipment that is relatively simple. Which combination of recorder/mic/headphones/carrying case do you recommend to start with? Hi, I want to combine the Sony PCM with the beer dynamic M-58 N (C). Will it work? What adapters would you recommend? The Sony PCM D50 is discontinued!?! What’ll I do? The price is in the $700-$800 range now. Should I wait for the next generation, or just settle for the M10? I’m new to the game, but still receiving student loan money. I have the money to buy the gear, but the gear I buy now will most likely be my only gear for the next 5 years. Will the M10 and a fine condenser do it? Should I worry less about the internals and just go with the Trascam DR-100mkII? In the age of backpack journalism I like the idea of not even needing a mic. I already have a Mackie Onyx Blackjack DAW for interviews where portability and immediacy are not a concern. I’m leaning toward the M10, or waiting for the D50’s replacement. What do you think? After reading this excellent guide, and doing some crafty searching on eBay, I went with the M58 and DR-100MKII. Both proved to be great on their own and combined. I’ve got useable audio from impromptu interviews conducted in a noisy pub, which was really a nice surprise. I also recorded my band’s gig on Thursday using the uni mics on the DR with the machine on a table in the middle of the club and the results were fantastic. Taped some meetings (instead of taking notes) using the omni and got a decent recording that was easy to decipher. All in all, a great combo for less than 450$. OOne of the greatest blog I have read forever. I really want to say that you are doing an excellent job for those person who love to listening everything on headphone. I am pretty surprised at the amount of good words you have for the Tascam DR100mkII. I have one, and Im really not happy with what Id consider dismal sound from it. Some background: I started with a Sony tape recorder 30 years ago and used it until minidisc came along and was very happy with the digital revolution. From there a D50 which set the benchmark for quality. I bought the D100mkII because of the XLRs and I had it two months before I opted for a Roland R-26, which you haven’t reviewed on the site at all, which is disappointing considering the size and price of the unit, it provides 6 channels with three sets of internal mics and the ability to use two XLRs plus a mini jack plus one set of internals all at the same time giving you a healthy range of redundancy. Its not the same quality as the D50 for its internal mics, but plug-ins are great. I use the R-26 with two MKH-416 and a set of custom binaurals plus the built in XY and the results for the applications are truly outstanding. I also use it with a Rode Lav mic and the internal XY and omnis for interviews and again its outstanding. Please apply your review to it, Id love to hear your opinions on it. Its the most versatile recorder out there. Shouldn’t your warning about the hissy sound of the Beyerdynamic M58 with most recorders be flagged a bit more clearly at the top of the page? M58 is listed as your ‘better’ mike choice- but you also say it doesn’t sound good with most audio recorders on the market (I’ve even used it with the Sony M10, and its pretty noisy even with that). I might sound a bit bitter- as a beginner, I was recommended to buy an M58 as my first mike purchase, and I struggled to get good clean audio with it for a long time. What’s wrong with it’s similar but much cleaner sounding big sister the MCE58? Hello Jeff, thank you for the wonderful and detailed gear recommendation! I wonder what are your thoughts on the new TASCAM DR-44WL? Is it a good new choice in place of Tascam DR-40? Hi, have you tried the DR-44WL? If yes, how does it compare to the DR-40? An isolation mount and pistol grip makes the whole set-up more cumbersome to carry and to use, so I often just go with the foam wrap, but it’s handy to have an isolation mount if you want to put the mic on the end of a boom pole or even in a mic stand, or on a camera, so that it’s protected from vibrations from the floor. I know it’s not always practical to train people to handle a shotgun mic if they’re not using it every day, but some foam padding or an isolation mount might make most of your problems go away. Is the Rycote still your top recommendation for a pistol grip c. 2019? Has anyone else had a hard time getting a loud enough recording with a Tascam DR100mkII? I adjust the input so that the levels register in the appropriate range on the display, the audio sounds good through my headphones as I record, but I end up with a nearly inaudible file after I upload it to my computer every time. I have tried lav mics and both the omni and uni built in mics. Thoughts? Will you be reviewing the Tascam DR44WL? I’d love to see how it stacks up against the DR-100MKII. Very interesting article – eye-opening in many ways – and thanks for all the good comments as well. I am currently “surveying” (that is, reading reviews and comments) small size field recorders for more ambient field recording use (i.e. importance of low self-noise, and good stereophonic capability) to buy one myself, and was wondering why nobody has said a word about the recent Zoom H5/H6 recorders? Both supposedly have very good pre-amps (much improved compared to the H4n), gain knobs, XLR etc. – just wondering whether it’s “regional” issue or something else I’m missing. It’s tricky to keep this original article updated as new recorders hit the market – but we’re trying! We did do a review of the Zoom H5, which is posted here: http://transom.org/2015/zoom-h5/ We liked it quite a lot, and would certainly recommend it as a field recorder. However, unless you need the simultaneous multitracking capabilities (recording from the built-in mics and the XLR inputs at the same time) we slightly prefer the Tascam DR-100mkII. It’s a close call, they’re very similar recorders, apart from the 4-track functions of the H5, but we’re trying to keep the Good-Better-Best list as streamlined as possible. But I could see the H5 nudging the DR-100mkII out of its spot if it appears that people are increasingly interested in the 4-track mode. In most cases, when I talk to reporters, they think it’s cool, but can’t imagine needing to record 4 tracks in the field. I can imagine a few circumstances where it might come in handy… And even beyond that, the basic functionality of the H5 is pretty good, edged-out by the SR-100mkII primarily by the placement of the input gain knobs, and the dual-battery capabilities. Prices for these recorders are pretty volatile, so it’s hard to make any reliable pronouncements about relative price, but in general, the DR-100mkII has been a little cheaper than the H5 too. But you could do well with either of those recorders, please do read the H5 review fro more details. Thanks for the helpful info. Would you recommend any sort of gear or techniques to reduce handling noise when using the shotgun mics? I’m looking specifically at the Rode NTG2. I’m relatively new to public media, so I don’t own a recorder yet. There’s a used Rode NTG1 in new condition selling for $170. I tested it today on a Tascam DR-100mkII and it recorded in excellent condition (or so my ears told me). I haven’t been able to find anything about the NTG1 on Transom. What recorder does it pair best with? It seems like a great beginner shotgun mic, what can you tell me about it? The Rode NTG-1 is a good mic, but we have generally recommended the NTG-2, simply because it gives you more flexibility in how you can use it. The NTG-1 MUST get phantom power from the recorder (or some external source) in order to function. The NTG-2 is the same mic, except that it has a compartment for an internal battery so that it can run with external phantom power, or from its own battery power. In the circumstance that you mentioned: pairing it with the Tascam DR-100mkII, the NTG-1 will work fine, because the DR-100mkII can feed phantom power to the mic. The only down-side of this arrangement is that the batteries in the DR-100mkII will drain faster. With the NTG-2, you could turn-off the recorder’s phantom power, extending its battery life by a bit, and use the mic’s internal battery. Similarly, you can use the NTG-2 with recorders that do not provide phantom power, such as any recorder with a mini mic input jack. So, if you’re always using the NTG-1 with a recorder that can supply phantom power (most recorders that use XLR input jacks can do that) and you’re not doing very long recording sessions that would make battery life a priority, then the mic will work very well. $170 is a pretty decent price for an NTG-1 in good condition, they sell new for about $250. The NTG-2 usually sells for about $20 more than the NTG-1. Hope that helps! Help help. Looking for a recorder with the same on unit editing ability of my old SONY MD. I could edit everything (or almost everything) on the train or walking (without the need to download to a computer). I just purchased a Rode NTG-2. While it sounds great, it’s far too sensitive to use as a hand held mic. It’s virtually impossible to move without it picking up hand contact/movement. 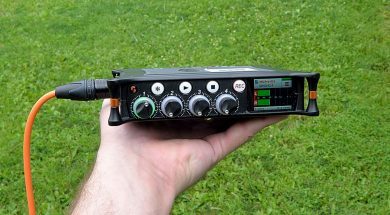 If you have a good field mixer connected to a good microphone and you only need the field recorder to record sounds coming from the mixer. Does it matter which field recorder you choose? Do the sound quality vary if you only use the field recorder to record? Is this possible? And if so which one would be a good choice? What about Zoom h6? Hi, I need some help about some other handheld recorders. I want to record music exclusively, and I have found multiple choices to pick from but it’s too hard for me to handle. The contenders are Tascam’s DR-40, and two Olympus products, the LS-P2 and the LS-14. I would mostly be using the internal mics. Any help and suggestions would be much appreciated, thank you in advance. I managed to get a cheap used electrovoice RE50 off ebay. I have a zoom H2N. Could I use two together for interviewing people? i.e. plugging the mic into the zoom to record it? Or do I really need to buy a different recording device to use with it? Sorry if this is a dumb question – I didn’t realise you had to be so incredibly tech savvy to make podcasts! I’m searching your website to try to figure out the right gear to get to produce a podcast of one to one interviews. After reading this article I thought I would be best getting an Electro-Voice RE50 mic, and then trying to find a second hand recorder to use with it. Note: we cannot recommend dynamic microphones such as the Electrovoice RE-50 or Beyer M-58 for use with most of these flash recorders. Im now unsure what recorder I should get to use with the Electro-Voice RE50 mic, and why in this article flash recorders do seem to be recommended for use with this mic. It would be great to get some help with this. What recorder would you recommend (cheap) to go with it? Jeff – What’s the audio quality of the Audio-Technica AT8010 (ATM10)? I’m a visual journalist specializing in multimedia storytelling via audio slideshows delivered to the web. I’m using a Tascam DR40 recorder with a Rode NTG2 shotgun mic currently. I’m looking for a smaller/shorter length XLR based mic that’s not going to cost me alot and wanted to look at a shorter length microphone for recording ambient audio and interview material while at the same time isn’t going to require phantom power due to mic pre-amp noise. There’s an editor’s note at the top that explains we updated the post in 2014. Still, it’s definitely time for us to updated it again! Samantha: Given you can’t buy the Sony M10 anymore an update is definitely needed. The mics might not change, but the recording devices surely will. As an example of relevant and important changes: in May 2017 Sound Devices released the amazing MixPre-3 and MixPre-6. Both are simply amazing. We’re in the process of working on a review of the MixPre-6. Stand by! Your knowledge and articles are always wonderfully informative and helpful. So now I come to you for wisdom. In the 3 or 4 years I’ve been doing radio, I’ve used and loved Sennheiser HD 202 headphones. Never paid more than $22 new, as recently as February. There’s never been a lack of places online selling them. I looked tonight and found that this was no longer the case. The cheapest I saw new started around $50 (with shipping), and go up radically from there. I’m mystified. And heartbroken. Amazon has only the HD 202 II at $102 (which appear identical to the old HD). It seems that Sennheiser no longer makes the 202s. Any insight would be appreciated! Thanks. What is a good alternative to the Sony M10? We can’t buy it anymore. Should we just move up to the Tascam “Better” model? Marantz 661 and Sennheiser MD21 – Strange but true! Hey dudes. There’s always been a bit of VP88 love with this crew, but I was wondering what y’all do for wind and shock protection? How do you get around the handling noise, the self-noise and the wind noise … while still being able to access the controls, whip it out without ceremony, etcetera? I use the mini medium windjammer from rycote on my vp88. It’s a little large in diameter and a little short in length, but because of this, it slides down just past the screen section on the mic. The folks over at trew audio hooked me up with this stuff called joe’s sticky stuff. It’s kind of like what they use to stick debit/credit cards to the sheets of paper when they mail them. I put a small ball of this on the mic where the windjammer drawstring / elastic is and it keeps it from moving around without leaving any residue on the mic itself. I was wondering for the good one, can the audio technica AT875R work as well? It´s the same price and I´ve seen it compared the Rode NTG 2. Any thoughts?